Have you ever had a to-do list SO long that you just didn’t do any of it? That’s me. So yesterday when I should have been frantically house cleaning for two back to back Thanksgiving dinners, I painted! One of the guest rooms at the lake house has a small wooden chest, a bed and a nightstand that my sweet neighbor gave to me when we first bought the house. It was unused in their basement. When they heard we were taking a truck load of furniture to the lake they kindly offered up several pieces. This bedroom set was one! The furniture originally was a reddish oak color. Right away I painted the bed and nightstand but the dresser sat in state for years. So yesterday I hauled it out on the front porch and got to work. I removed the original knobs and gave the entire piece a light sanding. The original knobs were wood like the rest of the dresser. I thought about using these brass pulls. I wiped it down and gave it three coats of white chalk paint. 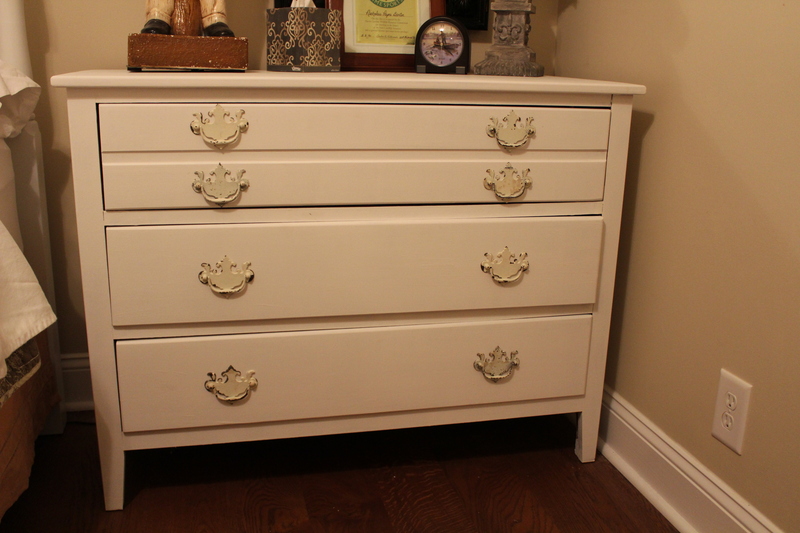 I used Amy Howard at Home chalk paint in white. I wanted to switch out the hardware on the piece so it would look old. I needed eight knobs or pulls. I found a few options in my treasure room stash. At first I was going to use these fancy gold pulls but the screws weren’t long enough. Plan B. I found these white vintage pulls and the screws were the perfect length. That is a sign that it was meant to be. This is how it turned out. I love it! I drilled new holes to accommodate the new hardware. I had to use some washers on the back because my holes were bigger than the head of the screws. Oops. But it worked out in the end. I put some new felt pads on the feet and dragged it back inside just before dark then time for a cocktail! Have a great day! A Chandelier Make-Over and a Chandelier Tree….